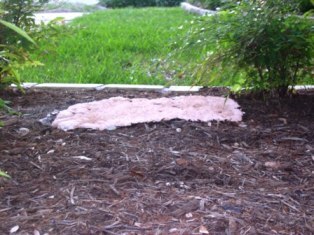 It’s scary looking, but slime mold sounds and looks much worse than it is. It is mostly a cosmetic issue. Slime molds grow on top of soil, on and in mulch and sometimes on plants with a dusty-gray, black, dirty white, red or yellow mass. Sometimes it looks like tiny round balls scattered over the ground or in organic material. If you rub these balls between your fingers, a sooty-like powder will be released. It often appears in mulched areas and looks like some animal threw up. In turf, slime mold spore masses coat the grass in spots and look like cigarette ash on the surface of the blades. 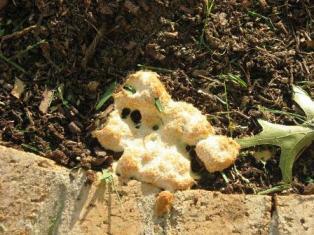 Slime molds tend to develop during wetter weather and feed on decaying organic matter. These fungi rarely hurt plants unless they grow up onto or over small seedlings. Several organic fungicides will kill slime mold. Cornmeal, cornmeal tea, baking soda, potassium bicarbonate and water or garlic will work. I usually just rough up the surface with a cultivating tool, hoe or turning fork. On turf, the spores can be easily wiped off or removed by rinsing with water during dry weather, or by mowing and raking at any time. It’s an interesting fungus, but there are much worse things to worry about. If you have any questions regarding this newsletter or any other topic, join me this weekend for my Dirt Doctor radio shows.